4 External Antennas: Provides you with the more stable WiFi signal and the faster speed; 1200Mbps provides fast speed which no more delays for the game, online transfer files and video. Low Power Consumption: Uses environmentally friendly design. It is stable with low radiation and low power. 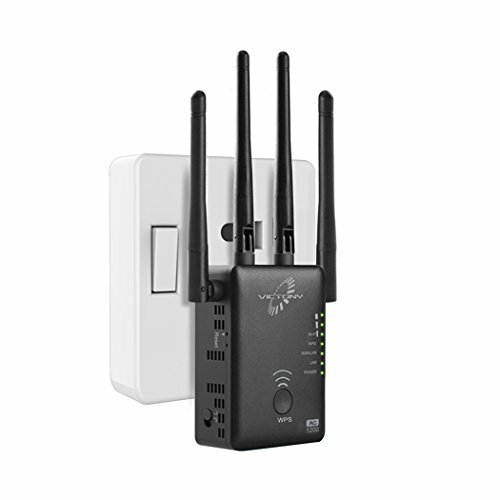 3 in 1 Functions: WiFi Range Extender (Repeater), Wireless Access Point, Wireless Router. Port: 1×10/100Mbps WAN/LAN PORT, 1×10/100Mbps LAN PORT. Plug and Play: Easy to install and use. The small and compact design makes it easy to implement and move flexibly. Superior Antennas: It can be going through very well and extend WiFi coverage to long distance with 4 high-gain 3dBi external antennas enhance wireless signal for stable data transmission.